Elias Perkins’s career in public service lasted nearly half a century and made him a popular figure both locally and nationally. His was a life that required seamless transitions from one position to the next while often juggling multiple responsibilities. Though a simple lawyer from southeastern Connecticut, his legacy carries far beyond the state’s borders, even reaching the international level with the work of his descendants. Elias Perkins was born on April 5, 1767, in Newent Society (now Lisbon), Connecticut. A dedication to scholarly pursuits motivated him to study law after graduating college and he eventually opened a legal practice in New London. This practice turned out to be a stepping stone into the larger world of local and national politics. In 1795 Perkins won election to the state General Assembly. He served as a representative there for the next 5 years, including a term as Speaker of the House in 1798. During this time he also earned an appointment as Assistant Judge of New London County. His career hit the national stage with an election to Congress in 1801. After serving one term in Washington, DC, he was back in Connecticut working in the legal profession and received a promotion to Chief Judge of New London County in 1807. This position he held until 1825, while also serving another term as New London’s representative to the state General Assembly in 1814 and as Speaker of the House again the following year. 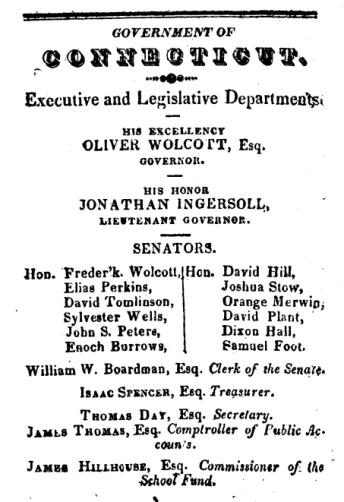 The year 1817 witnessed Perkins win election to the state senate. He served as a state senator until 1822. The service for which Perkins earned his greatest acclaim was as the Mayor of New London. Elected on the Federalist ticket in 1829, he served in that position until 1832. Outside of his political achievements, Elias Perkins proved very popular through his involvement in the local community as well. Once hosting a visit by the Marquis de Lafayette, Perkins was also a member of the local Masonic Lodge, a Deacon in the First Congregational Church, and the first president of the New London Bank. Elias Perkins died in New London on September 27, 1845, at the age of 79. He received a burial at Cedar Grove Cemetery. His life’s work carried on, however, through his grandsons, who served as the US consuls to both Hawaii and Tahiti.